Harry How / Getty ImagesFloyd Mayweather and Conor McGregor. Former five-weight world champion Floyd Mayweather says there are six reasons why UFC star Conor McGregor should be seen as the favourite to win their boxing rules contest next month. Mayweather is a 10/1 bookmakers favourite to defeat McGregor when the two trade punches at the T-Mobile Arena in Las Vegas on August 26. A number of prominent boxers have also said McGregor stands no chance in this fight. Ricky Hatton, for example, told Business Insider that he expects the fight to last “a few rounds” before Mayweather knocks McGregor out. 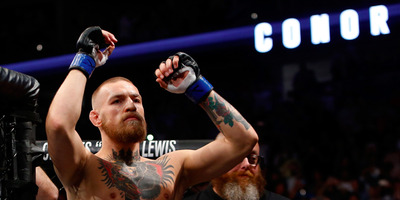 The 40-year-old says McGregor is 1) younger, 2) taller, 3) has a greater reach (the distance between a fighter’s knuckles and armpit), 4) is an active fighter, and is 5) a heavy hitter. Worryingly, Mayweather also claims that 6) he is yet to formulate a game-plan to beat McGregor. 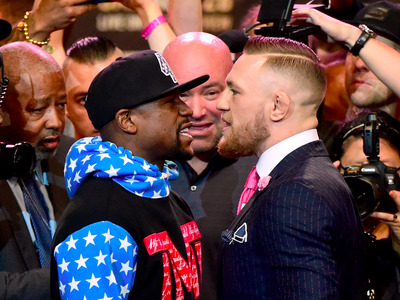 “Everything is leaning toward Conor McGregor,” Mayweather told journalists on Tuesday. “He’s younger, taller, and has a 74 inch reach (I have 72 inch reach). Mayweather added: “I don’t know what the game-plan is, I’ll have to speak to my father [his trainer, Floyd Mayweather Sr]. Steve Marcus / Getty ImagesConor McGregor.